Ohhhh! So there really are five FINALISTS! Not five PICTURES! I get it now!!!! I love the way you made the irregulars symbol her shadow. That's a great idea! GOOOOO KITTY! I AM SO HAPPY FOR YOU!!!!!!! The way you made the Irregular symbol her shadow is COMEPLETLY AWESOME!!!!!!! Good job! Wow, I didn't notice the shadow thing! That's so original-nice work! The way you did the shadow was pure genius! It is really good. how does the first drawing work? 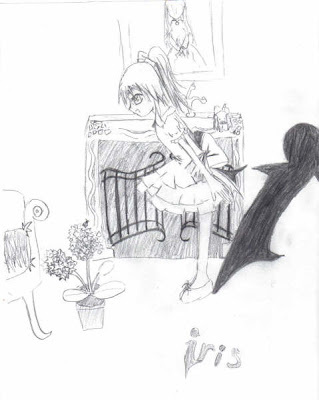 did iris really wear a strapless dress and high-heels? anonymous: erm... idk... It's something I randomly thought of. Actually, I just modified one of my random doodles XD. Another reason is that if I put straps on, it would be quite hard to ink. 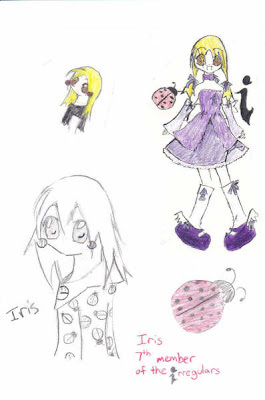 ^^' Yeah, I am pretty lazy ^-^' So I'm not sure about Iris' dress, I just made it up.